Harding Black gifted Baylor University his personal collection of thousands of ceramic objects, spanning the length of his career, from the 1930s to the 1990s. The glazes that Black developed are still taught in ceramics programs around the United States, including at Baylor. Harding Black Collection and Archive #3911, box 11, folder 6. Harding Black has long been considered one of the pioneers of the American studio ceramics movement, and his work is today held in public and private collections throughout the United States. In 1995, as Black was preparing to retire from 60 years as a teacher, artist, and researcher of ceramics, he entrusted Baylor University and Paul McCoy–his fellow ceramist, fishing partner, and close friend–with his personal collection, in the hope that future generations of students and researchers would continue to build on his legacy. When Black passed away in 2004, Paul McCoy delivered his eulogy to the National Council on Education for the Ceramic Arts annual meeting. Harding Black dedicated his life to his art, and to honor that commitment, Baylor University’s Texas Collection partnered with the Department of Art to preserve and digitize Black’s personal research notes, and to photographically document thousands of ceramic objects from his ceramic test collection. This digital archive makes Black’s work accessible to artists and academics around the world. On August 14, 2015, the Texas Collection opened an exhibit featuring dozens of ceramic works by Harding Black, curated by Paul McCoy. These objects are on view at the Texas Collection through October 14, 2015, from 8 am-5 pm, Monday-Friday. The exhibition, lecture, and reception are free and open to the public. For more information, contact Paul McCoy at Paul_McCoy@baylor.edu. “Armstrong’s Stars” is a collaboration between the Armstrong Browning Library and Baylor’s Texas Collection. Once a month we feature a story about a celebrity that Dr. A.J. Armstrong brought to Baylor. These stories highlight an interesting part of Baylor’s history and include collection materials housed in both the Armstrong Browning Library and the Texas Collection. This month’s story was contributed by Baylor graduate (BA ’14) and Sigma Tau Delta member Rebecca Hans. On April 16, 1920, at five o’clock in the evening, poet William Butler Yeats shared about his life and influences and read his work in front of a packed house of Baylor students, faculty, and community. The evening, part of the university’s Diamond Jubilee celebration, had been eagerly anticipated in four Baylor Lariat articles articulating not only W.B. Yeats’s notability and talent, but also the hard work of Dr. A.J. Armstrong for orchestrating the visit. The Lariat especially emphasized the singularity of the event, urging students not to miss the unique opportunity. The first news regarding the event was an April 1st issue of the Baylor Lariat. The piece announced W.B. Yeats’s lecture and described him as a poet “considered by all competent critics the foremost English man of letters now living.” The lecture would be titled “Friends in my Youth” and was already expected to be “a great day in Baylor history” (“William Butler Yeats” 7). These early Lariat articles advertising Yeats’s appearance are particularly interesting from a modern perspective. In 1920, Yeats had not yet achieved the irrefutable eminence associated with his name today but was instead described as a brilliant poet on the rise. Many of the great works for which Yeats is known today had yet to be written; even “The Second Coming,” one of his most famous works, may have been unknown to the Waco audiences. Regardless, the literary community thought highly of Yeats. He was so respected even in 1920 that the Lariat accurately prophesied that his “name and work will take place in the front rank of the poetry that passes from this generation to posterity” (“W.B Yeats Secured for Friday, 16th” 1). 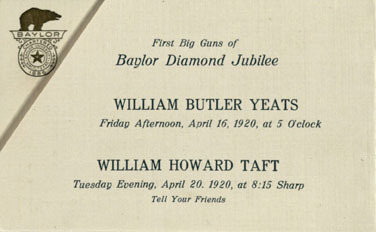 When the official invitation appeared advertising the “First Big Guns of Baylor Diamond Jubilee,” Former President William Howard Taft and the poet William Butler Yeats both shared the advertisement. Although President Taft’s portion was presented in a grander style, Yeats’s portion was given equal importance. The invitation emphasized Yeats’s appearance as an important event for anyone interested in “world affairs,” not just a night out for poetry enthusiasts. These instructions were heeded, and long before Yeats took the stage, a varied collection of people paid fifty cents to fill Carroll Chapel to capacity (“William Butler Yeats Delivers Fine Lecture” 1; “Yeats Friday, 5 O’Clock” 2). The poet laureate of Texas, Judd Mortimer Lewis, also came to Waco specifically for the event, and introduced W.B. Yeats to the crowd himself. Yeats began the lecture, “Friends in my Youth,” with details of his childhood, specifically the influence of his father, an artist. The larger part of the talk, however, focused on his mentors and other literary men who had profoundly influenced his growth as a man and poet. Of these influences Yeats mentioned Arthur Symons, Francis Thompson, and William Ernest Henly, and read examples of their work aloud to the Waco audience. To the delight of the crowd, Yeats read aloud from his own work for the concluding half hour, “a treat to lovers of poetry” (“William Butler Yeats Delivers Fine Lecture” 1). 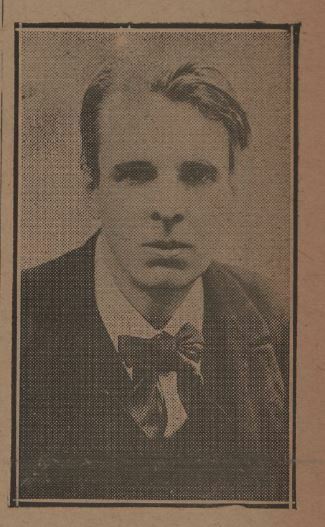 Although the bulk of Lariat coverage focused on Yeats himself, the writers did credit Dr. Armstrong’s work bringing influential speakers to the campus: “The policy of Dr. Armstrong in bringing men to Baylor is to get men who have a world-wide reputation” (“W.B Yeats Secured for Friday, 16th” 1). In a letter to the University President, Samuel Palmer Brooks, Dr. Armstrong reflected on the events of the previous year and described in further detail what the Lariat titled “his policy”: My primary purpose is not to make money but to give the students an opportunity to come in contact with world forces and world geniuses. I believe it is one thing they will remember longer than anything else connected with their school days. I consider these attractions all of the highest type and I think my English Department is gaining launch for itself abroad. Today, Baylor University features visits from world-renowned thinkers, writers, and speakers who also share their work and experiences with the university and community. The English Department especially has preserved Dr. A.J. Armstrong’s tradition through events such as the Beall Poetry Festival, an annual event bringing internationally acclaimed poets to Waco. Many modern students can speak with a similar satisfaction as those of 1920, although many may wish they had been present to witness “the biggest literary man that has yet spoken in Carroll Chapel,” as William Butler Yeats shared his story and his art (“W.B Yeats Secured for Friday, 16th” 1). Works cited: Armstrong, A.J. to Samuel Palmer Brooks, 4 April 1921, Andrew Joseph Armstrong Papers #0449, Box 1, Folder 1, Texas Collection, Baylor University. First Big Guns of Baylor Diamond Jubilee, Invitation. The Texas Collection, Baylor University Libraries, Waco. Print. W.B Yeats Secured for Friday, 16th.” The Lariat 8 Apr. 1920: 1. Web. 3 Oct. 2014. “William Butler Yeats.” The Lariat 1 Apr. 1920: 7. Web. 3 Oct. 2014. “William Butler Yeats Delivers Fine Lecture.” The Lariat 22 Apr. 1920: 1. Web. 3 Oct. 2014. “Yeats Friday, 5 O’Clock.” The Lariat 15 Apr. 1920: 2. Web. 3 Oct. 2014. Elm Street in East Waco flooded by the Brazos River, 1908. Photo by C.M. Seley. helped support her dissertation work.